What word do we have in the English language that comes close to expressing this idea: "brokenness is the beauty"? The Paradoxical collision of sacrificial selfless love with the nefarious nature of crucifixion unleashes a tidal wave of impact: the defeat of the powers of sin and death, and the provision of the saving grace made available for mankind - all met at the cross of Jesus Christ. No wonder this hideously beautiful moment stands as the center-point of human history. Perfect love, total wrath, graceful beauty, complete brokenness, malicious cruelty and compassionate kindness all occupied the same space in one climactical moment. Such was the truth that God gave us for Baja, Hungary July 10-17, 2011. The Hungarian word for beautiful miracle: Csodalotos. A visual arts team (Artslink - led on this trip by Pat Butler, who actually came up with the theme word that became the focal point of our outreach), a Dance team (Dancelink), a contemporary band (Bill Drake Band), and a Church team from Peachtree City, GA, all converged on this beautiful Hungarian city just a few miles from the Serbian border. The results were eternal. The Tipping Point came on a Wednesday evening when the leader of the Dancelink Team, Cheryl Vigereaux, spontaneously began to dance to the song "How Great Is Our God" in the little cellar/converted into a chapel of the Language School where we were based in Baja (boy-a), Hungary. Sharing in devotions on Thursday morning, one of the team broke down as she tried to convey a vision she had seen during that dance - the bricks in the cellar exploded outward in an array of blinding light, and all of a sudden Cheryl, who hadn't missed a step, was dancing before the King of Kings, who was on His throne. Our team-mate expressed that our Lord was pleased with this worship, and was pleased to see us glorify Him with our talents and gifts. This set the team up for an expectancy for Thursday evening, and God did not disappoint. After a full day of drawing, sculpting, dancing, and harmonizing, the Hungarian campers were ambushed by the love of God. Hungarian Translator Bence exhorted the campers to come up and share what they were experiencing. Camper after camper related how loved they felt here, and in that love, they were experiencing God. Bence related the love of Christ, which compels us to share Him, His truth, and His love. A number of Hungarians were in tears, and a number gave their hearts to Christ. It was an awesome evening, But nothing prepared us for the explosive response we were to experience the following evening outdoors in Baja City Center. The high-water mark of the Camp/Outreach was Friday night in a stage in the city center square. 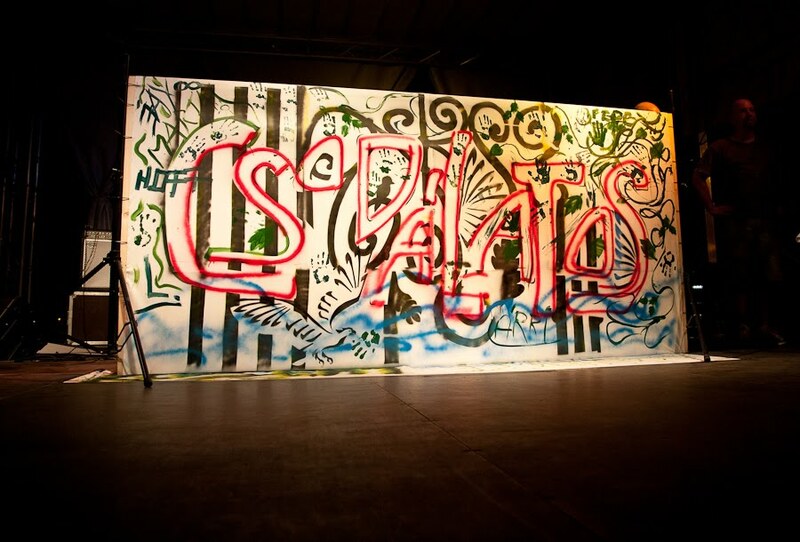 Hundreds of Hungarians were drawn to the vibrant sound of our Bands, the colorful power of our Dancers, and the awesome spectacle of our visual artist's graffiti wall, painted on a huge canvas during the last song of the Bill Drake Band concert. 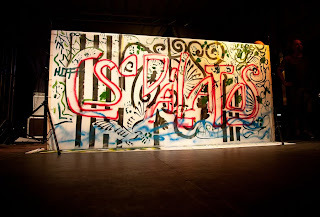 Bill, who had been leading from behind his keyboard, came to the very front of the stage, and pointing to the graffiti wall, asked the crowd who would like to declare that they would like Jesus to do in their hearts and lives what was so colorfully and skillfully displayed on the canvas: Csodalotos. Bill exhorted the audience to indicate a decision to follow after Jesus Christ by coming up on the Stage, wetting their hand with paint, and putting their hand-print on the canvas around the word. Many came forward, and the Artslink team had the joy of helping all those who were making decisions to come forward and make their mark for Christ. Around 30 came to Christ that evening.